"The trainer was very good and explained everything well - excellent"
"Great training day! We learnt all the elements we need for our publications & the buffer of 3 months support too!" "Very helpful... will certainly use in the future." "Covered the essentials at a good pace & in enough detail... just the right amount to start creating & editing your own docs"
"Very good...The interaction element was really helpful. Trainer was really friendly and cheery"
"Really interesting, can't wait to get stuck in"
"Brilliant, look forward to putting it into practice." "A great introduction to the basics of Flash." The science park to St. John's Innovation centre. The university city of Cambridge is a regular training venue. We've trained various companies in and around Cambridge as far out as Cambourne, Newmarket, Huntingdon and St. Ives. A Intermediate Microsoft Excel 2016 Training Course at the offices we use at the Regus in Cambourne is easy to set up and conduct even at short notice. Or maybe you just want us to come to you bringing a projector, laptops with Excel preloaded along with fully comprehensive course notes. Cambridge was actually the first area we started training. From Cambridge Consultants on the science park to ARU, CRC (Cambridge Regional College) and many more have taken advantage of the computer training courses conducted by us. Lists, lists, lists it seems as if the whole world is a bundle of lists. It doesn''t matter what industry you are associated with you will need to analyse and present data. 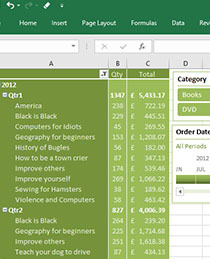 You don''t have to have attended the beginners Excel training course to join this one. However being a little familiar with Excel will, of course, be a great help. If you have Excel 365 then this is the course for you. There are many other courses you could take from this point on. Especially with regard to data analysis and manipulations. Please take time to check out the following courses. Power Pivot Training Course - Take your Pivot Tables to the next level with our introduction Power Pivot training course. If you feel that your Pivot Tables and/or Pivot Charts are someone limited then this is the course for you. Power BI training course - If you have the data you need prepared but need more appetising charts, graphs and other visualisation to make your data palatable then look no further than a Power BI training course.